"Our longer term goal is to weave human body parts in the lab." The development of super materials is changing our world —from carbon nanotubes to graphene. Scientists and engineers the world over are continually developing newer ways to apply these materials. Researchers from the University of New South Wales (UNSW) in Australia are adding another material to this list, and it’s one of a biological origin. UNSW researchers, in a paper published in the journal Scientific Reports, describe how it’s possible to craft advanced functional materials using “nature’s tissue weaving algorithms.” Specifically, they have engineered a “smart fabric” that mimics the sophisticated and complex properties of a bone tissue called periosteum. This tissue covers all the bones in the human body, except for the joints, and gives bones added strength to bear high impact loads. This resilience and durability come from periosteum’s complex collagen arrangements, elastin, and other structural proteins found within it. 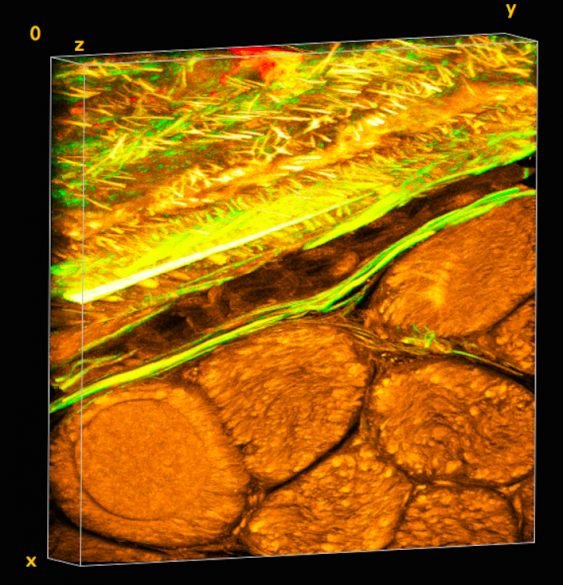 The team mapped periosteum’s complex tissue architecture and modeled these in 3D. These computer models were used to scale up and produce fabric prototypes using a state-of-the-art computer-controlled Jacquard loom. “We then tested the feasibility of rendering periosteum’s natural tissue weaves using computer-aided design software,” said lead researcher Knothe Tate. There was some challenge in retrieving a periosteum-based fiber from its 3D computer model into the weaving loom to become an actual material. “The challenge with using collagen and elastin is their fibers, that are too small to fit into the loom. So we used elastic material that mimics elastin and silk that mimics collagen,” Tate said. With proof of concept tests completed, the team is now getting ready to produce fabric prototypes of this periosteum fabric. Patents for this super material are already pending in Australia, the United States, and in Europe. The materials’ applications are expected to range from advancing functioning medical materials, to improving safety and transport technology. This material could even be used with ‘smart’ compression bandages that respond to the movement of patients with deep-vein thrombosis or similar ailments. It could help to develop protective suits that harden under high impact for extreme sports athletes, soldiers, or even astronauts. It could also be used for making safer steel belt radial tires. While these applications are all great, the application intended by the UNSW researchers is more biological. “Our longer term goal is to weave biological tissues – essentially human body parts – in the lab to replace and repair our failing joints that reflect the biology, architecture and mechanical properties of the periosteum,” lead author Joanna Ng explained. The team is currently working towards this next stage, hoping to unlock the potential of this super material.